USA naturals...I live about 7 miles from the Mississippi River. My husband and our sons originally built our home overlooking this majestic piece of flowing water but because of a landslide we had to move our home to a lovely farmstead. That story could fill a book. I won't bore you with those details here, but I have often gazed at "Ol Man River" wondering how his pearls look? Well, you can see for yourself that natural USA pearls are quite amazing...almost "to die for". The colors are stunning...green, pink, golden, white and I've heard of black ones as well. This particular group has very high luster. Our city was famous for pearl buttons years ago and several folks collected the pearls they found during clamming. Most pearls were sold to dealers from large cities like New York who came through, but some special ones like these were held back for keepsakes. Although stringent laws prohibit mass collecting of clams today, I have been given the opportunity to offer these beauties on my site for sale....coming soon. 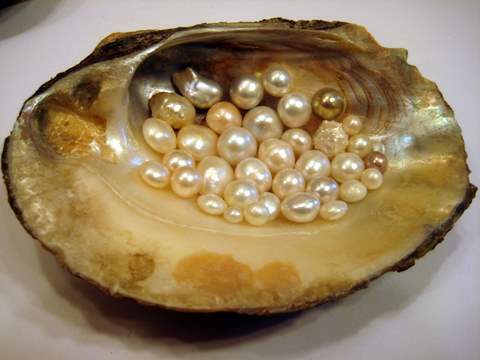 Read more USA freshwater pearl information here. Here is an outstanding collection of natural USA freshwater pearls in a Three Ridge clam shell from the Mississippi River. A local fish hatchery has a nice display of various types of Mississippi clams. I enjoy the common names, like "Pocket Book", "Heel Splitter", "Eye Glass Case", "Elk Toe". I am so fortunate to live by the Mississippi River and even more fortunate to be able to offer these amazing pearls for sale soon. 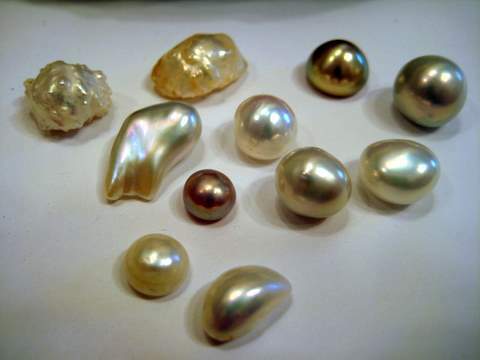 See more photos of USA natural pearls and read more info here.